SUNDAY MAY 20 (Groton, CT) – A year after falling quietly twice to the UConn Avery Point, during district play, the Vikings gave top-seeded UConn everything they could handle, ultimately falling 13-10 during an 11-inning thriller that was about as exciting of a game as has been seen at this level, ever. Combined with a loss to Monroe Community College that began just minutes after the heartbreaking loss to open the tournament, and Westchester Community College’s season has ended. The Vikings finish the season with a 28-12 overall record, a Mid-Hudson Conference Championship, and their fifth straight Region XV Crown. Sunday’s opener was not for the faint of heart. A back-and-forth start to the game saw UCAP take a 4-3 lead into the fifth inning, and from that point on, a playoff baseball game became a battle to see who would be the last team standing. 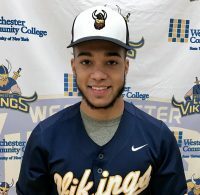 In the fifth inning, trailing by a single run, Sean Vanegas (Bronx, NY/Mount St. Michael) hit a two-out, two-strike, two RBI double to give the Vikings a 5-4 lead. An inning later, the lead became 7-4, when Paul Franzese (Somers, NY/Somers HS) blasted a two-run home run, and Westchester appeared to be cruising. However, UConn scored twice in the sixth, and three more times during the seventh inning to take a 9-7 lead. After failing to score in the eighth inning, Westchester came to bat in the top of the ninth, desperate to find a way to avoid a huge hole by dropping the first game of the double-elimination series. When his team needed a big hit the most, Jose Delacruz (New York, NY/George Washington HS) delivered. The sophomore belted a three-run home run to give WCC a 10-9 lead heading into the bottom of the ninth inning. However, the Pointers battled back yet again, hitting a game-tying home run in the bottom of the frame to force extra innings. In the bottom of the 11th inning, UConn-Avery Point hit a three-run walk-off home run to end the game, and force the Vikings to defeat Monroe Community College to keep their season going. For Westchester, Franzese went 3 for 5 with three RBI’s and two runs scored, while Bobby Wootten (Ardsley, NY/Ardsley HS) went 2 for 5 with two RBI’s and a run scored. Vanegas also had two hits and two RBI’s. Sophomore pitcher Nick Antenucci (Yonkers, NY/Stepinac) gave Westchester six strong innings, allowing five earned runs against a potent UConn line-up. Unfortunately for WCC, Monroe Community College was just a bit too much for Westchetser, ending the Vikings season by a 7-2 final score. After Franzese blasted a home run in the first inning to give Westchetser 1-0 lead, Monroe scored seven unanswered runs over the next seven innings to give the Tribunes a 7-1 lead heading into the eighth inning. In the eighth, a James Houlahan (Yorktown Heights, NY/Lakeland HS) RBI groundout brought WCC one run closer, but that was as close as the Vikings would get, as Monroe won the game 7-2 to advance to the finals of the District Tournament. Scottie Giordano (Croton, NY/Croton-Harmon HS) had two of Westchester’s four hits – both doubles – while Franzese went 1 for 2 with two walks. Pitcher Max Marienberg (Scarsdale, NY/Scarsdale HS) suffered his first loss of the season despite a solid performance, allowing three earned runs over five innings. MONDAY MAY 14 (Yonkers, NY) – One time per season, the Westchester Community College Golf team gets to host an Invitational Tournament as part of the Mid-Hudson Conference’s round-robin format that sees every member program host an event. On Monday, Viking freshman Joseph Danko (Yorktown Heights, NY/Somers HS) made sure that his lone home event for the season would be unforgettable. Not only did Danko shoot a career-best round, but his 74 shaved 10 strokes off of his best performance to this point, and was statistically the best round of golf played by any Mid-Hudson Conference golfer this season. Thanks to Danko’s first-place finish – seven strokes ahead of any of the 28 golfers competing, the Vikings earned a second place finish on Monday, increased their season point total to 23, and are one good round away from their third consecutive Mid-Hudson Conference Championship. At Dunwoodie Golf Course in Yonkers, New York, the Vikings finished with a team score of 357 to finish second behind Rockland Community College. How good was Danko on Monday? His opening round in Mid-Hudson Conference play this season was a 95 during an event at Woodstock Golf Course on April 23 to finish in 13th place out of 32 golfers. Monday’s effort was 21 strokes better than that performance … less than one month later, and a full 10 strokes better than his previous performance, an 84 on May 3 at Spook Rock Golf Course. He not only turned in the best effort by a conference golfer this season, but he is now the only Mid-Hudson Conference golfer to shoot in the 70’s this season. Also for Westchester, sophomore Andy Perez (Ossining, NY/Ossining HS) turned in another solid effort with a fifth-place 86, while Cian Guilfoyle broke a 100 with a 96 total. THURSDAY MAY 17 The Vikings cinched their third straight Mid-Hudson Conference championship with a 2nd place finish at the Sullivan Tournament at Lohmoor golf course in Hurleyville NY. Joe Danko shot a 77 to be the low medalist for the second straight tournament. His 77 was only the second sub 80 round shot by a conference golfer in a conference tournament this season. Danko moved into first place in the conference season standings. Sophomore Andy Perez finished 2nd in the tournament with an 80 and freshman Cian Guilfoyle shot a 95. The Vikings finish the season in first place four points ahead of Rockland.